Cooler weather does not have to be the enemy. Take a look at the 10 Best Dog Cold Weather Coats! They come in many different sizes and wonderful levels of warmth. It doesn’t matter if your weather is the coolness of a Mexican or Alaskan winter. There is something here for everyone. This coat is for the climates that experience large number of wet precipitation days. So, if you are in Seattle or Maine, this is the coat for your pup! This is made of a durable fleece that will keep up with your pup during the more adventurous hikes or splashes in mud puddles from melting snow. This particular item is showcased in an orange color and machine washable. This coat looks like a suede coat that has a soft polyester fleece lining. It looks very similar to other suede coats that are available for their human owners. So, you can hit the trail together in style. This is 100% polyester but machine washable and dryable. There are two different types of connecting agents on this jacket to ensure that it will stay on your pet. One is around the collar area and the other is around the ribcage. This is the coat for the family that is on the move. This has a versatile fit but tough enough to get through the toughest situations. If your dog is an adventurer – this is the coat to wear. This has a light nylon outside that will repel water but also deter from getting caught on thorns. Its machine washable and ready to take on the world. If you are looking for an easy coat to put on and off your dog, look no further. There are two quick Velcro straps to connect and you are ready to go. This has a nylon outer shell that incorporates an inner fleece lining to make sure your dog is warm during the winter months. It also has a detachable hood that you can use during the colder days. The whole unit is machine washable. 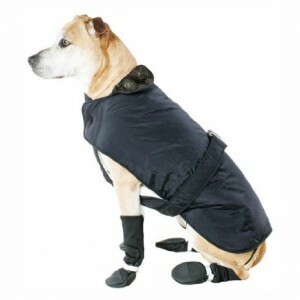 If you are looking for a parka for your dog – don’t look any further! 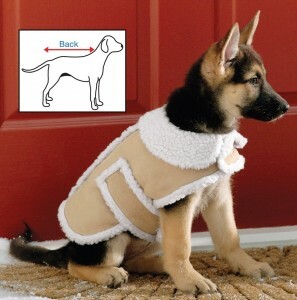 This coat will wrap your dog in warmth including the chest and belly areas. It connects around the neck and chest line. There is a secondary connection that wraps around the belly area. Nothing too tight. 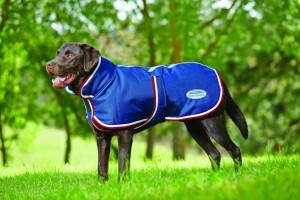 It’s a waterproof, durable coat with a very warm fleece lining. This coat is for someone with an eye for fashion. 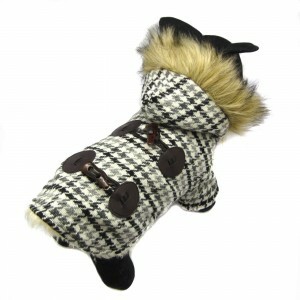 This is a grey plaid fashion coat complete with decorative buttons and a fur-lined hood. This is more of a special event type coat than one that you would take through the woods. It is made of a soft material and is fully fleece lined. It’s the perfect walk around town coat that your pet needs. This coat is one for many seasons. It will keep the moisture off your dog while allowing for full natural movement. 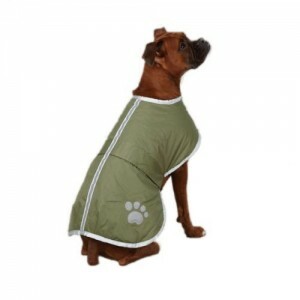 This has a fleece lining that will allow your dog to stay warm. If you are someone who loves the woods or long walks after nightfall, this unit has a flashing LED strip with reflective piping so that you can find your dog. Not all of us are in the winter areas that expect snow. Some of us just experience a very rainy season. This coat is to embrace that trend. This is the rain jacket for larger dogs! This jacket doesn’t have a fleece lining but it has all the characteristics that will make it viable for the rainy areas: waterproof, highly breathable and extremely durable. This coat can take anything. This coat is for the fine fall days or the warmer but dry winter days when the dog does not need much coverage or warmth. It is ideal for outdoor activities like walking or some exploring. It is machine washable and has a built in collar system. This coat comes in three distinct colors with plenty of relective designs for late night walks. This coat has a waterproof shell with a soft fleece interior. The perfect combination for those late night walks. There are many coast solutions for your pet. 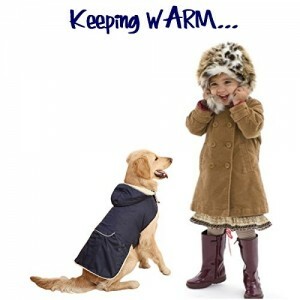 Some coats listed here can wrap the dog in a cocoon, while others just cover the basic areas. Please keep in mind what you are looking for in a coat for your dog – how much warmth, how much coverage, do you want it to be machine washable or fashion conscious? These 10 Dog Cold Weather Coats are the best can fit any budget and fit the correct environment for you and your pup.